blog.dinogane.com: How Did You Hear About Osama Bin Laden’s Death? How Did You Hear About Osama Bin Laden’s Death? Mashable is running a poll, How did you hear about Osama Bin Laden's Death? I, for one, heard the news through Twitter. 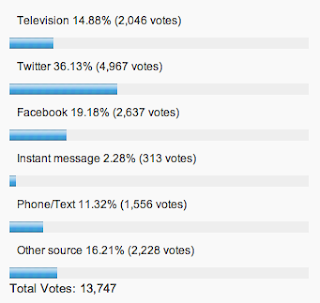 A snapshot of the poll results suggests I'm not the only one. It's crazy to think Twitter did not exist five years ago.